What is Populism? Jan-Werner Müller. University of Pennsylvania Press. 2016. Populism is a hot topic of which there is no shortage of analysis. By combining theoretical rigour with his knowledge about the empirical realities of populism, Jan-Werner Müller nevertheless manages to add some important and so-far neglected points in What is Populism? He organises his book around three questions, the latter two of which still lack scholarly attention: namely, what do populists say; what do populists do when they are in power; and how should they be dealt with? To discuss the merits of the book, it is worth outlining Müller’s answers to each of these questions. Müller starts by characterising populism as a specific form of identity politics that is critical of elites, anti-pluralist and has a moral claim of representation (2-3). The introduction and the first chapter (‘What Populists Say’) represent the scholarly ‘meat’ of the book and discuss competing definitions of populism. Müller argues against conflating populism with ‘irresponsible politics’ or equating it with the fears or anger of voters. Such psychologising analyses, according to the author, show voters that the so-called ‘liberal elites’ are condescending and ‘unable to live up to their own democratic ideals by failing to take ordinary people at their word’ (16). Instead, he settles on the form of representative claims as a criterion of populism: namely, that populist claims are moral and symbolic rather than empirically testable. Populists are those politicians that claim to represent ‘100%’ of citizens while not accepting the legitimacy of other actors that make representative claims. The second chapter addresses what populists do when in power. While this question is gaining attention, Müller still argues against the basic misconception that populists are unable to govern (4). He identifies three populist techniques of governing: the occupation of the state; mass clientelism; and the repression of civil society (44). While these strategies may also occur in other regimes, populist governments can practise them openly as they make a moral claim to the state. For populists, it is imperative that ‘the people’ (or their representatives) take control of state institutions. As populists turn states partisan, he extensively criticises the terminology of ‘illiberal democracy’ (49), and instead suggests ‘defective democracies’ (58). He also returns to his definition of populism by discussing how in democracies different representative claims coexist, while populists in government (and the constitutions they write) attempt to put an end to democracy’s perennial boundary problems and internal renewal (72). The last chapter addresses the pressing question of how to respond to populists. 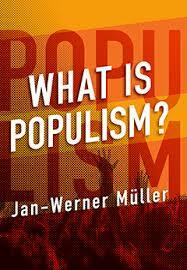 While much of the chapter is dedicated to explaining populism’s appeal and criticising common responses to populism, Müller ultimately suggests that to engage with populists: ‘One can take their political claims seriously without taking them at face value’ (84). Thus, politicians and the media should address the issues raised by populists but challenge their framing. Regarding the US, he makes a case for addressing the doubts of citizens who call for cultural closure by alleviating their economic worries (91-93). Regarding Europe, he cautions that its political systems were built on a distrust of popular sovereignty, fuelled by the experience of fascism (93-96). Thus, scepticism towards the technocratic response to the Euro crisis is often conflated with populism. Müller criticises actors who condemn any critique of elites as populist as well as those who imagine a ‘left populism’ that is less exclusive. Instead of lamenting populists’ disrespect for pluralism and inclusive political communities, we have to find more convincing arguments for both. Politically, rather than engaging in the construction of ‘the people’ as a whole, he suggests building partial majorities within political systems that bring in the excluded without marginalising the currently powerful (99). Müller’s book is both analytical and involved, the work of a public intellectual in the best sense. It addresses a variety of issues related to populism today, whether it is new constitutions and referenda in Eastern Europe, the US election campaign or the questionable inner-party democracy of the Italian Cinque Stelle movement (31). Müller is not afraid to ask uncomfortable questions, such as whether the liberal critique of populism has failed or whether populists are simply successful politicians disliked by mainstream candidates. While going through a range of examples, he maintains a level of abstraction that makes the book interesting to all readers. Academically, the book is most promising where Müller addresses democratic theory. Exemplary is his discussion of Hungarian Prime Minister Viktor Orbán’s use of illiberal democracy, where Müller not only fervently defends liberalism as an integral part of democracy but also outlines what an illiberal democracy would look like by pointing to the history of Christian democracy as a culturally illiberal ideology that nevertheless upheld politically liberal rights (54). Thus, he provides strong arguments why populist leaders should not ‘get to keep ‘‘democracy’” (56). This is based on a conviction he shares with much of the populism literature: namely, that populism does not offer an attractive ideological alternative to democracy. Instead, populists use democracy’s broken promises and ‘the language of democratic values’ (6) to deform democracy. Thus, many of his arguments are a call for a democratic renewal that takes its own principles more seriously. The analytical value of Müller’s definitions nonetheless remains to be seen. Since the book is not an empirical study, he does not provide a coherent operationalisation. Distinctions between populist and liberal claims in practice are sometimes upheld through hypotheticals (40) or context criteria (73) rather than rigorous definition. Some of his ideas, like the characterisation of populists in power and particularly the civil society aspect, remain without concretisation. This is partly due to the format of the book: it is not a systematic structure but Müller’s argumentative chains that drive the narrative. His arguments are recursive, addressing similar issues from different angles. This draws readers in, but it also means they have to reconstruct the answers to each chapter’s guiding questions throughout the entire text. As a result, as with any thought-provoking book, the reader may find as many new doubts as answers. With its vivid style, What is Populism? is very timely and remains accessible to a general audience despite Müller’s extensive engagement with political theory. At just over one hundred pages, the book is so engaging that while writing this review, I discovered more and more friends and colleagues were eagerly reading it. Thus, with Christmas approaching, What is Populism? may be the perfect gift for researchers as well as for interested friends and family members who have always wondered what political scientists actually do. Theresa Gessler is a PhD candidate at the European University Institute. Her current research focuses on parties that mobilise for democratic renewal, both in an inclusive and populist sense. She is particularly interested in Eastern and Southern Europe and has previously studied at Central European University in Budapest.